We are at the coolest entertainment spot downtown Budapest, 4 private rooms plus a dorm, ALL ROOMS WITH SEPARATE BATHROOMS &WC at the lowest price possible. Welcoming Hungarian palinka drink for each our guest! 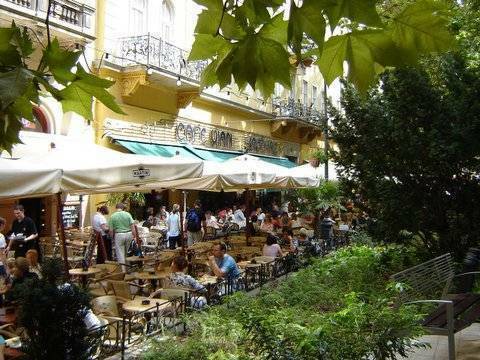 Situated at one of the coolest spots in downtown of Budapest, just going down 15 steps the Liszt Ferenc square, a number of fashionable pubs, restaurants and entertainment places at just 1 min. walk are waiting for you to discover them. 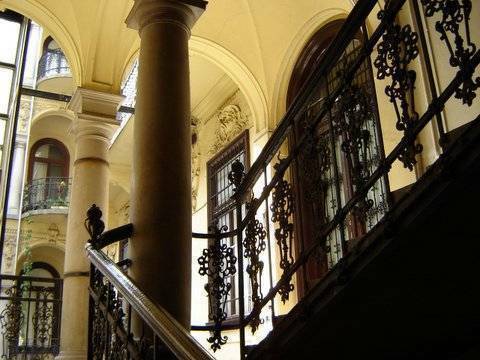 You can hear the exercising musicians at the famous Liszt Ferenc Music Academy nearby*. The famous Váci street or the Danube bank are at 5 min. trip by the yellow underground or 10-15 min. by walk. Near by you can find internet café, money exchange, two banks, bank cash slot-machines, fast food restaurants (McDonalds, Burger King) within a short walk as well. Parking possible nearby. *the hostel is at a very silent place, there you will not hear any music or noise unless you or your mates make some. 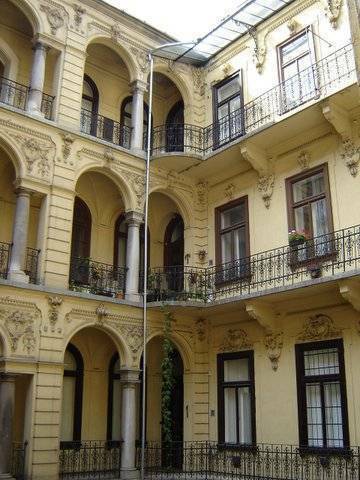 Our hostel can be found on the first floor of a typical Pest downtown building in the pedestrian zone at maybe the famous squire of Budapests city centre. The hostel has a total of 5 rooms on 100 m² and can accommodate 17 persons in four 2-3 and 4 - bed private rooms, plus a dormitory (6 beds, the dormitory is also used as private room depending on the demand). All the rooms incl. the dormitory have own bathrooms with toilet, we have also well-equipped small tee-kitchen place, and a small reception site. The soft, Mediterranean style and design we tried to achieve warms up the hearts of our dear guests. 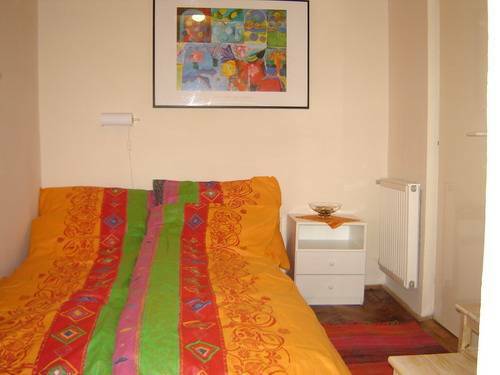 Amigo Hostel is surrounded by plenty of restaurants, clubs, pubs, cafés, shops. Nearby you can find internet café, money exchange, two banks, bank cash slot-machines, laundry, fast food restaurants (McDonalds, Burger King) within a short walk as well. Parking possible nearby. By the nearby underground stop, connecting to the other metros at the Deák tér stop, you can reach simply any main point of the city in max. 25 min. trip. 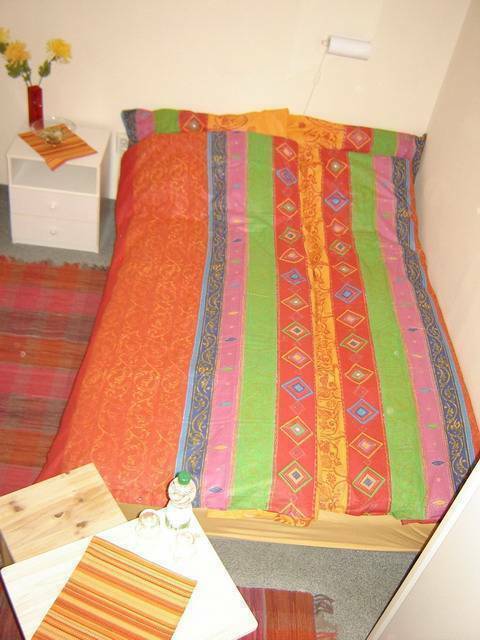 So: super location, low prices and private rooms with own bathrooms & toilets: What can you look anymore for? We have few ensuite (each room is with own bath/toilet) 2-3-4 bed private and double rooms, one of the rooms is used as dorm from time to time. currently there is no non-stop reception and we may not be at the hostel just then) *you can come after 8.00 am to leave your luggage at our hostel, but you can occupy your room after 11 am only. Payment: Payment is in cash upon arrival in HUF (Hungarian Forints). There is an exchange bureau, bank & bank cash slot-machine near by, no problem for you to get Hungarian Forints for your currency. Key deposit: We request 2500HUF (~10EUR,~12USD) deposit for one key; and if you can give it back, you will get the money back at your departure. If you can not, we will keep this money for covering the costs of the new keys. Check out: till 10:00h (10 am) Do not forget to give back the keys, youre getting money back! Cancellation of the booking at least 72 hours prior to arrival time is free of charge. In case of cancelling the booking from 72 to 48 hours prior to arrival time: half (1/2) night stay will be charged. In case of no show or cancelling within 48 hours prior to arrival time: 1 nights stay will be charged. In case of cancelling the booking from 72 to 48 hours prior to arrival time: 1 night stay will be charged. In case of no show or cancelling within 48 hours prior to arrival time: 2 nights stay will be charged.